No Excuses: Robots Put You In Two Places At Once It's getting cheaper to be there even when you're far away. Companies that make "telepresence robots" hope to save busy people the hassle of travel. 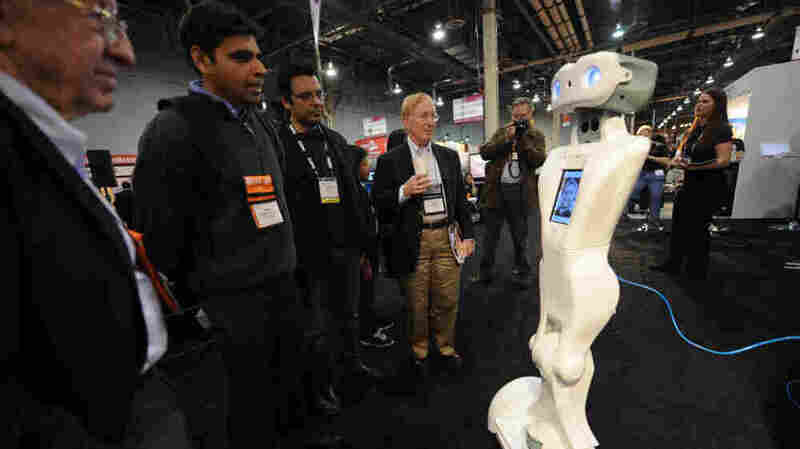 The QA telepresence robot by Anybots chats with people on the floor at the Consumer Electronics Show in Las Vegas in January 2009. The CEO of one Silicon Valley startup uses an Anybots robot around the office when he's away on business. Technology that allows people to be present even while far away is becoming more affordable than ever. Companies working on "telepresence robots" are building off the idea that busy schedules and the hassle of travel require such products. The robot at Evernote looks a little like a stick figure on wheels. Its bulbous head has two eyes, which are actually a camera and a laser. On its forehead is a screen, where you can see Libin's face and Libin can see employees, like Andrew Sinkov. "You know, it's probably better than having him be right next to me," Sinkov says. "I'm kidding ... It's pretty cool. When he's not around, this is a good way to communicate with him." Libin is often traveling to his company's other locations in Japan, Austin and Zurich. His company makes products that help people remember everything from chores, names and appointments to random thoughts. He says using the robot to stay connected to his home office is better than a video conference program like Skype, which connects to a computer stuck in one room. "Whereas with a robot ... I can just roll around. I can roll into a meeting that somebody else is having," he says. "I can sort of say, 'Hey, what are you guys talking about?' I can go up and look at the whiteboard. I can point at things with the laser." Libin purchased his robot from a company just down the street in Mountain View, Calif., called Anybots. At the Anybots offices, there isn't a conventional receptionist. Instead, a robot named Angela greets them. "I am the receptionist here at Anybots, which is one of the services we offer, which is called the Any Lobby service," she says. The human behind Angela is Melisa Ward. She remotes into the robots from South Carolina, where she lives. "We can log into several different locations all in one day and provide a plethora of different functions," Angela — that is, Ward — says. Companies buy the robot, then rent Ward's services for a few hours at a time. Anybots was founded by Trevor Blackwell, who had been looking for a way to make robots popular. They've been searching for the "killer app" for robots. Don't think terminator. Blackwell was looking for a program that would make robots popular the way spreadsheets popularized computers. He decided the key was robots that could help people be in two places at once. "The need is there because travel gets more and more painful and expensive, especially overseas travel," Blackwell says. "So there are a lot of engineers here who are working with factories in Asia, and they need to oversee, minute-by-minute, what's going on there." One of Anybots' telerobots costs about $15,000, which, he points out, is about the cost of one overseas trip. Ken Goldberg teaches robotics at the University of California, Berkeley. He thinks Blackwell may be on to something. "There's a lot of excitement because it seems to tap into this idea that we're increasingly busy," Goldberg says. He imagines with our crazy schedules many of us may find it useful to, for example, send the robot to the office party, while you're home with the kids. "Right now we would consider it really weird and rude and inappropriate, but you could imagine that maybe after a while that might be kind of OK," Goldberg says. "You're still there, right? You're spending time, but you're sitting in your pajamas at your desk." He says just this year he saw several commercial companies like Anybots open up to sell telepresence robots. According to Goldberg, the technology has finally reached the point where it's affordable, and with our busy lives, there's a growing need to do more, be in more places, see more people. However, there's a downside too: We may soon be in a world where there are no more excuses for not showing up.